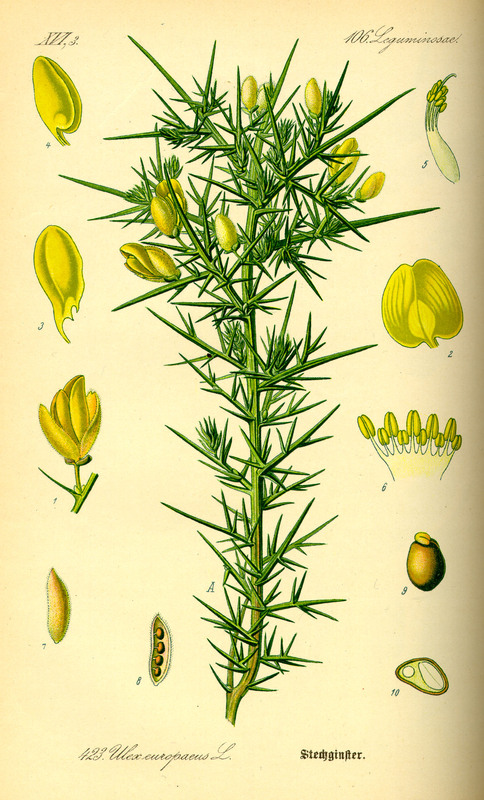 Ulex europaeus is a spiny, densely branched shrub to 2 m tall; stems terminating in a spine. Leaves numerous, crowded, all reduced to spines, to 1.5 cm long, no normal leaves, except in young plants. Flowers bright yellow, pea-flower-shaped, to 2 cm, in branched clusters. Fruit pods to 2 cm long, wooly-hairy, with 2-4 seeds. Habitat: Escaped from cultivation. Dry, sandy soil, open areas. Notes: Probably shaded out by successional vegetation in less disturbed sites.